Expedient Laundry is a membership-based service for Bryant students. Payment is requested in full upon registration. We're currently offering four pricing plans. Sign-ups are welcome prior to the semester's start as well as at any point during the school year. Step 1: Once registered, you will be contacted by our customer service team via email, prior to the start of the semester. At an established time/date and location on campus, you'll then pick-up your new Expedient Laundry bag and an ID # will be assigned. Step 2: Stuff your Expedient Laundry bag laundry with all your dirty clothes (we don't advise including any delicate garmets). Step 4: Pick-up your clean clothes the very next day at the same location between the same hours. If you forget to pick-up your clothes there is a location on campus where you can pick them up or an Expedient representative will make other arrangements with you. If you have a conflict and cannot pick-up your clothes, you can arrange for a friend to pick them up for you. As a trusted & professional laundry company, we handle your clothes with the utmost care. All colors and whites are separated and your clothes are washed individually (we even pair up your socks!). Every garment will be washed, dried, and folded. 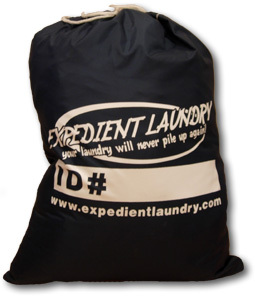 We even wash your laundry bag! Service is temporarily suspended during school holidays where there are three or less days of classes during the week. Examples are Fall Break, Thanksgiving, and Spring/Easter Break. If there are no classes on Mondays, we still operate that afternoon.